The equine species has evolved to live on open grasslands. They are active for much of the time, wandering as they graze, and engaging in locomotory activities. Evolutionary changes to the mouth, teeth and digestive system have resulted in modern horses, who are a species of herbivorous grazers. Their digestive system has evolved to sustain a foraging diet of complex plant materials high in fiber and rich in cellulose requiring extensive fermentation. The large bowel of the equine has evolved to work best when there is an almost constant supply of food making its way through the digestive system and the entire process from ingestion to defecation takes around 48 hours. 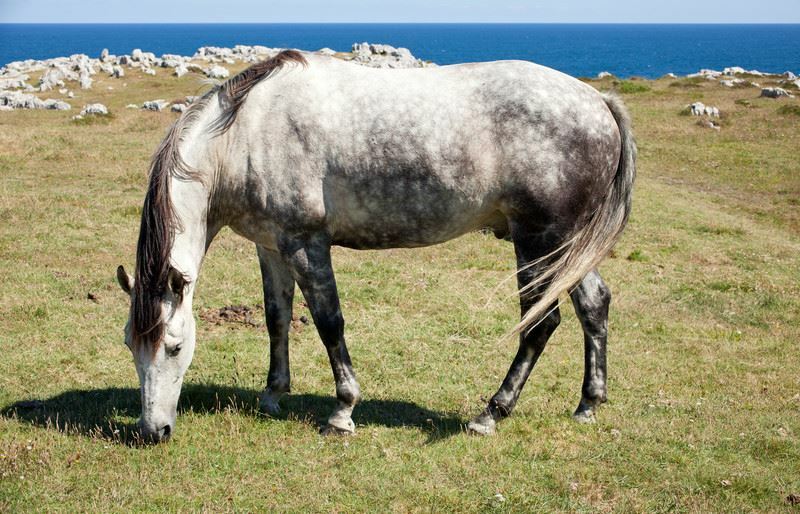 The ability of the horse’s digestive system to cope with a diet high in concentrated feed, combined with limited access to forage, is testament to the species’ ability to adapt to ensure its continued survival. Inability to graze, eat a natural diet, and have a constant trickle of food going through the digestive system can result in horses predisposed to a range of physiological and psychological conditions. Unlike humans, horses only produce saliva when they chew. The quantity produced is dependent on chewing time. Saliva is mostly made up of bicarbonate and is swallowed with food, and acts as a very necessary buffer to stomach acid. It also contains a high level of mucin, lubricating the esophagus to aid swallowing. Concentrated feed and limited access to forage results in reduced chewing, which leads to a lack of saliva production and a high susceptibility and occurrence of gastric ulcers. Concentrates are easily digestible and eaten quickly. This inevitably leads to periods of fasting. The lack of a continual trickle of food in the digestive system can lead to chronic and acute digestive problems. Horses fed a high proportion of their daily food intake from a height can develop significant physical, postural, and pain issues. Horses have a biological need to graze. When they do not have this option a number of significant psychological and behavioral issues can emerge. The horse has an innate need to move as he eats. In their natural setting, horses are not stationary for much of the time, and lack of movement due to stabling or restricted turnout has an impact on homeostasis. Providing adequate nutritional needs in the wrong context does not address the basic needs of the horse or provide the ability to express natural behavior in his movements or the way he eats. Horses should receive an adequately nutritional diet in a form that is natural to the species. The base of the diet for EVERY class of horse should be pasture, hay or “chop”/chaff. Access to forage should always be available, along with regular browsing opportunities. Horses should be provided with a properly balanced diet that meets their nutritional needs. Scientific laboratory analysis of the current diet. Nutritional requirements of the individual horse are measured by a qualified equine nutritionist or veterinarian based on current National Research Council Guidelines. Specific supplements to reach those nutritional requirements and a balanced diet are calculated by a qualified equine nutritionist or veterinarian.